There were just enough posts in my feed reader this morning with the acronym LAPCPADPOUB to make me curious enough to find out what it meant, even though I’ve heard that curiosity killed the cat. But I took my chances. Like a cat who catches a whiff of catmint and won’t be satisfied until he founds the actual plant, I followed a trail of links to trace this acronym back to Happy Mouffetard of The Inelegant Gardener blog from across the big pond over in England. LACPADPOUB stands for ‘'Lets all post cat photos and dire poetry on our blogs’, and today, October 12th, is the day they chose for this great blogging event. This seemed right up my alley since I like acronyms, having listed many of the more commonly used ones on my blog the other day. But I did have to embrace and overcome three obstacles do this post. 3) I might risk offending cat lovers or embarrassing my family by writing about the cats in my neighborhood, none of which comes running up to me to be petted, but all of which seem to find my garden a nice place to prowl around at night and leave deposits for me even though none of them should be outside roaming around because we have a city ordinance that says they shouldn’t be allowed to roam freely, but that doesn’t seem to stop them or their owners. But obstacles are put in our way to be overcome! Finally, I have an excuse to post a cat picture and write bad poetry. It’s a two for one. The picture above is of the neighbor’s cat. I’ve caught him in my garden more than once, and I’ve chased him away, more than once. I’ve, oops, accidentally watered a shrub he was laying under, only to have him come running out like he was shot from a cannon. Yes, honest, the first time that happened, I didn’t know he was under that shrub. Really, everyone who loves cats, I am doing this cat a big, potentially life-saving favor when I chase him out of my garden and back toward his own yard. You see, his owners had him de-clawed, all four paws, so he can not defend himself if/when he runs into trouble. And he does run into trouble in the wilds of my neighborhood. In fact, the owners told me that earlier this summer he got in a big fight with something, and they had to take him to the vet to get stitched up. I haven’t seen the cat in a while, which hopefully means his owners have finally figured out that a de-clawed cat is a house cat, not a yard cat, and definitely not a cat that should be roaming about the neighborhood. Oh, that made me mad when he thought my garden was his litter box, so mad that I can’t even figure out how to finish this limerick. And that concludes my contribution to LAPCPADPOUB. Thank you, Carol, for joining in LAPCPADPOUB Day! It all started as a rather tongue in cheek idea, and it's great to see so many people rising to the challenge! Great poem. Luckily it's illegal to declaw cats in the UK. Kewt cat, what a pity it's declawed. Declawing is illegal in the Netherlands too as it's too cruel for words. It's fun to see that even people who are not owned by cats are joining LAPCPADPOUB Day. BTW my post is up too, no surprise there, please bring a bucket. Declawing a cat, and then letting it outside. Cruelty beyond belief. Some people should not be allowed to own animals. Good for you to chase the poor thing home, you might just save it's life. Now that I am finished my rant, great post, beautiful kitty. Even cats with claws can't hold their own with wildlife. I tried to tell my neighbors . . . . . I hope your neighbor kitty is safe. As for the poetry - well done! great entry! I wonder how far it will spread? Cats were made to prowl, that's why they have claws! I'm telling you, Carol, you need your very own kitty! 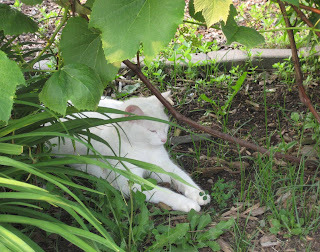 We also have a white cat that passes through our garden from time to time. What fun! I had given up on LAPCPADPOUB for the very two reasons you mentioned--but now I have been put to shame! Ah well. Maybe next year! By the way, I also have a neighbor with a declawed cat... the cute little girls next door have told me all about "the mean cat" that comes around and beats up Mr. Kitty. Since they're 6 and 8, I bite my tongue... but in my head, I educate them about the simple steps that could be taken to prevent that!!! Good to see you guys from over the pond helping to make LAPCPADPOUB day a truly international event! Being bad at poetry puts you at a distinct advantage and I see the slight problem of not owning a cat has given you a rich seam of a different perspective to explore. De-clawing a cat is rather like de-tonguing a politician: just one step too far. I was not sure whether, when it comes to the awarding of prizes, limericks actually counted as poetry. But then I noticed that your final line was so gloriously chaotic that I realised that it wasn't a limerick at all but some sort of mutant free verse.